You are at:Home»Featured»Is Agrarianism Just for Hippies? Ever since the industrial revolution and the mass migration of Americans from rural areas to cities, there have been periodic fledgling back-to-the-land movements. Each of these trends was a reaction to the low wages and exploitation of factory workers. Nostalgia for “simpler times” and the desire for more self-determination inspired many to move back to rural areas and to small farms or self-sufficient homesteads. World War II interrupted a significant and growing back-to-the-land movement in England. In America none of these movements really took hold until the early 1960’s and 1970’s. The back-to-the-land movement of the Hippie generation, like previous agrarian movements, was a reaction to corporate greed, the exploitation of workers, and additionally to the increasing use of chemicals big agriculture. However this Hippie counter-cultural revolution was also intertwined with rebellion from all authority, drug use, and protest of the Vietnam War. Because of these real, but unfortunate, associations many people even today view the new agrarianism with suspicion. There is a new agrarian movement today. Many of the same rationales are in play, additionally, there is recognition, both in the movement and in the larger community, of the benefits of what is coming to be known as “localism”: that is communities will be stronger and people more interdependent when the necessities of life are produced from local raw materials sold into in the local community. Another hallmark of the current movement is “sustainability”. Small diversified farms raise beef, pigs, and even chickens on pasture where fertilizer for the pasture and for other crops comes from the livestock. In this way manure is returned to the ground; chemical fertilizer is eliminated and the waste and environmental nightmare of maintaining huge lagoons of animal waste (causing runoff pollution in water sources) so common on factory livestock operations is removed. Ultimately sustainability in farming makes farming possible and self-renewing without outside intervention. Sustainability is practiced by rotating livestock and crops to naturally return to the soil the nutrients needed for good crops and healthy livestock. Growth hormones, antibiotics, and chemical fertilizers all become obsolete on a sustainable operation. Finally, but fundamental to the new agrarianism, is a spiritual dimension. This new movement is led by families with deep-seated Christian beliefs who are seeking a simpler life which rejects consumerism and consumption as a way of life. This is truly counter-cultural. These families realize they are choosing a lifestyle which rejects the gods of the world in order to experience the Creator of the world in the cycle of the seasons and in the cycles of life. Rural life can provide a profound spiritual benefit. Many of Christ’s parables use examples from the agricultural society in which He lived to teach about the kingdom of God. Christ’s disciples could relate to the yoke and the sower because they had placed yokes on oxen, had sown seed, and reaped what they had sown. It is one thing to have these parables explained during a homily or Bible study. It is another thing to experience these things in everyday life which brings the lesson to clarity. 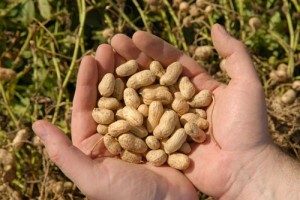 This past week my family has been harvesting our modest peanut crop. We leased four acres from our neighbor, plowed the field with a horse, planted with hoe in hand, weeded and cultivated by hand, and now are harvesting by hand. In some areas the pigweeds had been too numerous for us to keep up with. Our hand implements and inexperience had hindered our ability to keep up. I was sampling the field by digging peanut plants in different areas. Those areas where we had successfully cultivated and beaten the weeds were showing a good yield, even in this year of severe drought. In those areas where the weeds had gotten the upper hand, the plants were choked and the yields were poor. As I dug peanuts I recalled the parable of the sower and how those seeds sown among weeds sprouted but were choked. St. Benedict teaches “stability of place”, not just for his monks, but for us all. We live in an “on the go”, constantly relocating society. We chase money so we can have the newest and the latest. My 94-year-old neighbor, who still farms, once told me all the young people left for the cities because they wanted “things”. He told me how growing up, they never had much cash or many things, but they always ate well and had what they really needed. This is the choice of sacrifice, but the reward is contentment with whatever God provides. This is the choice of the families of the new back-to-the-land movement. Today, we have many things, but there is a great cost. Many of us are slaves to consumer debt and have little self-determination in our lifestyle due to our employment conditions. For example, how many of us can properly celebrate the feast days and Holy Days of our Faith? Our priorities, influenced by the false priorities of the companies we work for, can easily become confused. There is a sacrifice, to be sure, in living a simpler life, but the rewards are thousand-fold. When I worked in corporate America, I provided all the money for the food, lights, mortgage, clothing, and toys, for the family. My children had their little chores, but no real material contribution to the family economy. What a difference now. Every meal put on our table is the result of a contribution from every member of the family. From vegetable to milk to meat, our family works together everyday to provide for each other. A new respect is present, both from parent for the child and from the child for the parent. The eggs, pigs, chickens and ducks we sell help keep the lights on. This is a true family economy. Dad doesn’t just go out and buy a new bookshelf; son makes one, maybe at Dad’s side the first time. Mom doesn’t simply buy a new quilt, she helps daughter make one, often out of gently-worn clothes. Working together, learning together, and having time to pray together makes a family, and ultimately the community, stronger. Back to the land! Surely this is not the path for every family, but it is an important movement. If the new agrarianism continues to grow and becomes a significant cultural phenomenon, it can reinvigorate the economy in rural areas, but more importantly this movement can provide a much needed spiritual revival of family and community life.